We all know that bran is an important source of carbohydrates and fiber, but the primary appeal of these muffins are their distinct flavor. They taste a little bit like gingerbread, only with raisins and nuts! These muffins are great with apple butter and with fruit kebabs alongside. Fruit kebabs are next on my list of posts for today. 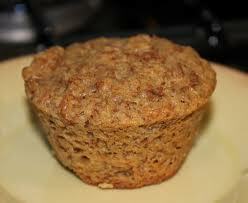 For you calorie and fat counters, this muffin has 2.1 grams of fat and 123 calories per serving! Let us begin! Go on over and preheat Mister Oven to 350 degrees. He likes it like that!! Now, coat a 12-well muffin tin with the cooking spray. We need to now warm the molasses and honey in a small saucepan over low heat until it just begins to steam. Remove from the heat and set aside to cool. Now, whisk the egg whites, yogurt and milk together in a large bowl until you have blended it real well. Whisk in the molasses and honey mixture. Using a wooden spoon ( I have tried other spoons and a wooden one works best! ), stir in the bran, then flour, baking soda and all the spices. Fold in the walnuts and raisins. Almost done! Fold the batter into the prepared muffin tin and bake for 15 to 20 minutes, or until a tooth pick inserted in the middle comes out clean. Serve warm with apple butter. The apple butter does add a few more calories…..but it sure tastes good!